Minor salivary glands (MSGs) account for only 10%–15% of all salivary gland neoplasms. Of which, the palatal MSGs are most predominantly involved, in nearly half the cases. Other infrequently involved regions are lips (15%), buccal mucosa (12%), tongue (5%), and floor of mouth (5%). Certain salivary neoplasms such as the ductal papillomas are more prone to develop at MSGs than the major ones. Sialadenoma papilliferum (SP) is one of its three subtypes of ductal papilloma, representing <1% of all MSG neoplasms. Approximately 80% of the SPs arise at palate. Only occasional cases have been reported from buccal mucosa, upper lip, retromolar pad, palatine arches, tongue and parotid gland., In this presentation, we demonstrate a SP located at a rare site, the lower lip of a 62-year-old woman. At an oral surgery outpatient clinic, a 62-year-old female attended with a tiny outgrowth located on the right half of lower lip since previous 2 years. Grossly, it was a pedunculated polyp measuring about 1.5 cm × 1 cm and beared few broad fronds of papillary excrescences. The surface was mostly covered by pinkish oral mucosa, but toward medially it underwent hyperkeratosis with a glistening pearly-white appearance [Figure 1]. Clinically, the lesion was interpreted as squamous papilloma. It was enucleated under regional anesthesia and was sent for histopathological confirmation. Under microscope, the lesion appeared poorly-circumscribed, with dichotomous epithelial proliferation. Superficially, there was exophytic and endophytic papillae of hyperkeratotic squamous epithelium, which were occasionally supported by slender fibrovascular cores. At the submucosa, these squamous fronds gradually merged into few ductal structures that mainly consisted of angular or arborizing ductules and some dilated cysts. Even some inverted papillary islands also beared a central ductal lumina there. The bilayer ductal epithelium consisted of the abluminal flattened or cuboidal cells and the columnar luminal cells. These luminal cells beared ample amount of cytoplasm with basally located bland ovoid nuclei. Occasional mucin-producing cells were also interspersed within the glandular epithelium. Further inward the ductal structures approximated with normal mucous salivary glands [Figure 2]. Any significant anaplasia or mitotic activity was absent. Depending on such histomorphology, the lesion was diagnosed as SP. Postsurgically, the patient was last examined on her 9 months follow-up without any recurrence. Ductal papillomas encompass three tumors: inverted ductal papilloma, intraductal papilloma, and SP. Lip is affected highest with the former two neoplasms, while the SP prevails at the palate. Isolated cases of SP have been reported from other oropharyngeal MSGs, parotid, and bronchus. Labial involvement is restricted to the upper lip only.,, In the current case the patient developed a SP in her lower lip. Although this site is quite populated with MSGs, a SP has never been documented there in the English literature. Therefore, lower lip becomes the latest example of sporadic SP involvement. Clinically, a SP often resembles squamous papilloma, inverted ductal papilloma, warty dyskeratoma, early developing verrucous carcinoma, and squamous cell carcinoma., Histologically, it is characterized by biphasic epithelial proliferation with exoendophytic papillary squamous excrescences and ductal elements. These ductules are bilayered and occasionally sprinkled with mucocytes or oncocytes. Superficial ulceration or stromal inflammatory infiltrates are variable., Diverse morphological features have also been described rarely. Such that, Reis de Sá Silva e Costa and Vizcaíno Vázquez diagnosed an entirely inverted SP, excised under a preoperative clinical suspicion of mucocele. In another tumor at mouth, Anuradha et al. encountered anaplastic nuclear features including increased mitotic counts. However, the overall histomorphology was clear-cut enough to be recognized as SP. On histopathology, incidental lesions may need to be differentiated from squamous or inverted ductal papillomas; and absence of encapsulation can mislead SP into a mucoepidermoid carcinoma. In such context, attention toward its classic histomorphology and lack of trimodal cellularity as in mucoepidermoid carcinoma estranges the SP from other microscopic mimickers. The lesion in the present case was grossly suspected as squamous papilloma. On routine histopathology, the tumor expressed distinctive biphasic morphology of a SP. The stromal inflammation was minimal, though it did not pose any diagnostic difficulty at all. The origin of SP has been debated from myoepithelial cells, intercalated duct, excretory duct reserve cells, basal cells, up to unanimous multipotent stem cells. Recently, an overall consensus has been reached about its excretory duct derivation, though the exact histogenesis is yet to be divulged.,, Calculated from the limited number of cases reported so far, its recurrence rate ranges between 10% and 15%, the highest among ductal and other oropharyngeal papillomas. These recurrent SPs usually resurface after an average interval of 3 years or so. Therefore, complete surgical enucleation, coupled with follow-up at constant intervals at least for next 3 years is the optimal therapeutic modality for SP., Malignant transformation of a SP has been rarely described. Two cases of squamous cell carcinoma and one each of epithelial-myoepithelial carcinoma and mucoepidermoid carcinoma have been reported. This presently discussed report highlights the lower lip as an uncommon location of SP. Therefore to prevent actual misdiagnosis, this tumor should be kept in consideration while diagnosing a papillary lesion at any MSG-bearing surface. In addition, from a prognostic point of view, explanation of its little recurring tendency might be useful in reassuring the patient. Pons Vicente O, Almendros Marqués N, Berini Aytés L, Gay Escoda C. Minor salivary gland tumors: A clinicopathological study of 18 cases. Med Oral Patol Oral Cir Bucal 2008;13:E582-8. Brannon RB, Sciubba JJ. Ductal papillomas. In: Barnes L, Eveson JW, Reichart P, Sidransky D, editors. World Health Organization Classification of Tumours: Pathology and Genetics of Head and Neck Tumours. 1st ed. Lyon: IARC Press; 2005. p. 270-2. Anuradha A, Ram Prasad VV, Kashyap B, Srinivas V. Sialadenoma papilliferum: Clinical misdiagnosis with a histological decree. Case Rep Dent 2012;2012:356271. Honda Y, Shiraishi K, Nomori H, Ishihara S, Iyama K. Sialadenoma papilliferum of the bronchus: Rare tracheobronchial tumor of salivary gland type. Pathol Int 2009;59:572-6. Santos JN, Barros AC, Gurgel CA, Ramalho LM. Sialadenoma papilliferum of the tongue mimicking a malignant tumor. Braz J Otorhinolaryngol 2013;79:404. Reis de Sá Silva e Costa FE, Vizcaíno Vázquez JR. Sialadenoma papilliferum with inverted pattern in a young patient: A case report. Am J Case Rep 2015;16:663-6. Pereira CM, de Oliveira Sousa H, Gasparetto PF, de Lucena Botelho T. Sialadenoma papilliferum: Case report and review of literature. J Health Sci Inst 2010;28:244-5. Liu W, Gnepp DR, de Vries E, Bibawy H, Solomon M, Gloster ES, et al. 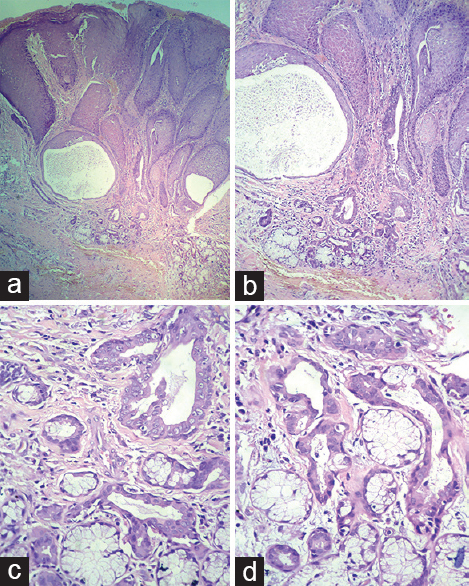 Mucoepidermoid carcinoma arising in a background of sialadenoma papilliferum: A case report. Head Neck Pathol 2009;3:59-62.